So far, we’ve talked about the basics of SPI communication and UART communication, so now let’s go into the final protocol of this series, the Inter-Integrated Circuit, or I2C. You’ll probably find yourself using I2C if you ever build projects that use OLED displays, barometric pressure sensors, or gyroscope/accelerometer modules. I2C combines the best features of SPI and UARTs. With I2C, you can connect multiple slaves to a single master (like SPI) and you can have multiple masters controlling single, or multiple slaves. This is really useful when you want to have more than one microcontroller logging data to a single memory card or displaying text to a single LCD. 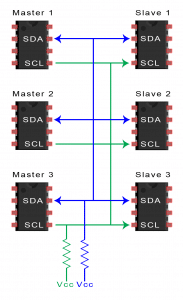 SDA (Serial Data) – The line for the master and slave to send and receive data. SCL (Serial Clock) – The line that carries the clock signal. I2C is a serial communication protocol, so data is transferred bit by bit along a single wire (the SDA line). Like SPI, I2C is synchronous, so the output of bits is synchronized to the sampling of bits by a clock signal shared between the master and the slave. The clock signal is always controlled by the master. Start Condition: The SDA line switches from a high voltage level to a low voltage level before the SCL line switches from high to low. Stop Condition: The SDA line switches from a low voltage level to a high voltage level after the SCL line switches from low to high. Address Frame: A 7 or 10 bit sequence unique to each slave that identifies the slave when the master wants to talk to it. 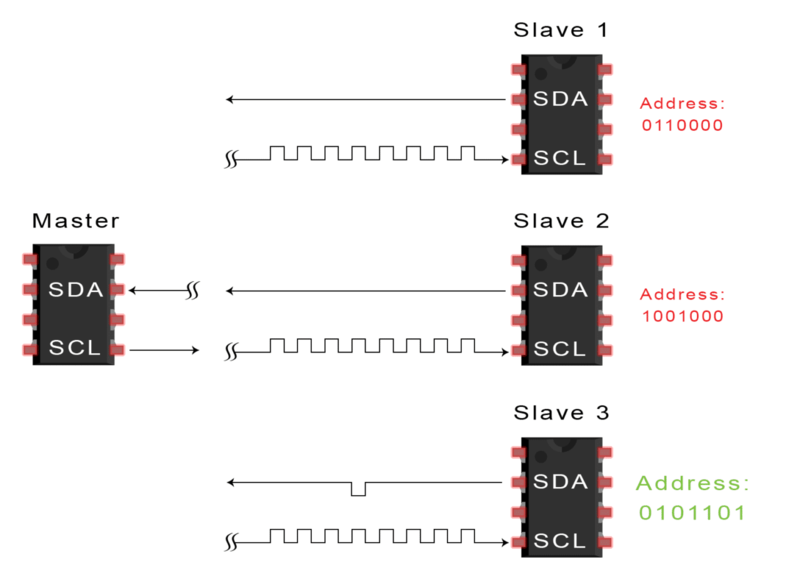 Read/Write Bit: A single bit specifying whether the master is sending data to the slave (low voltage level) or requesting data from it (high voltage level). ACK/NACK Bit: Each frame in a message is followed by an acknowledge/no-acknowledge bit. If an address frame or data frame was successfully received, an ACK bit is returned to the sender from the receiving device. I2C doesn’t have slave select lines like SPI, so it needs another way to let the slave know that data is being sent to it, and not another slave. It does this by addressing. The address frame is always the first frame after the start bit in a new message. The master sends the address of the slave it wants to communicate with to every slave connected to it. Each slave then compares the address sent from the master to its own address. If the address matches, it sends a low voltage ACK bit back to the master. If the address doesn’t match, the slave does nothing and the SDA line remains high. The address frame includes a single bit at the end that informs the slave whether the master wants to write data to it or receive data from it. If the master wants to send data to the slave, the read/write bit is a low voltage level. If the master is requesting data from the slave, the bit is a high voltage level. After the master detects the ACK bit from the slave, the first data frame is ready to be sent. The data frame is always 8 bits long, and sent with the most significant bit first. Each data frame is immediately followed by an ACK/NACK bit to verify that the frame has been received successfully. The ACK bit must be received by either the master or the slave (depending on who is sending the data) before the next data frame can be sent. After all of the data frames have been sent, the master can send a stop condition to the slave to halt the transmission. 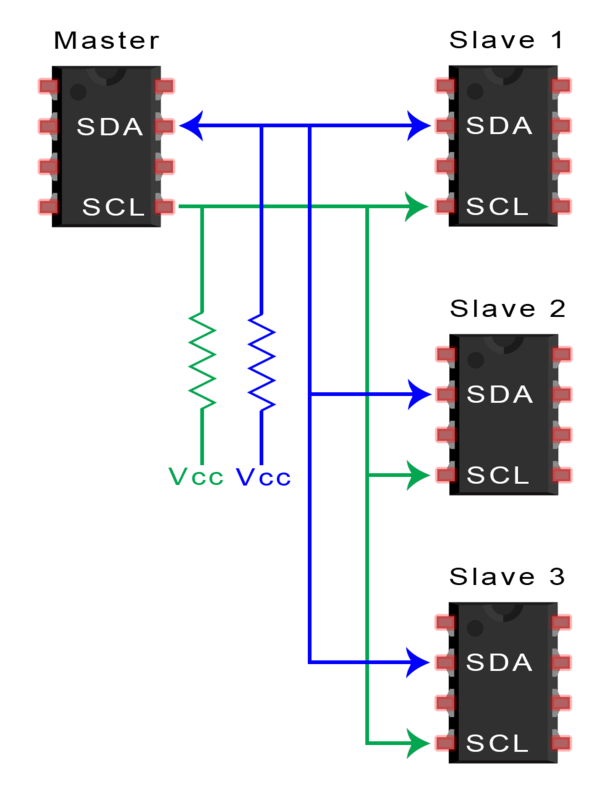 The stop condition is a voltage transition from low to high on the SDA line after a low to high transition on the SCL line, with the SCL line remaining high. 3. Each slave compares the address sent from the master to its own address. 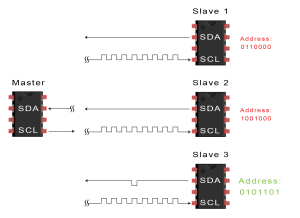 If the address matches, the slave returns an ACK bit by pulling the SDA line low for one bit. If the address from the master does not match the slave’s own address, the slave leaves the SDA line high. Thanks for reading! Hope you learned something from this series of articles on electronic communication protocols. In case you haven’t read them already, part one covers the SPI communication protocol, and part two covers UART driven communication. If you have any questions or have anything to add, feel free to leave a comment below. And be sure to subscribe to get more articles like this in your inbox! Great series of posts. Thanks for sharing this! Thanks very nice information. I liked all your articles and the way you explained all. Please add for PCIe communication as well. Great post. Thank you very much !! Step 1 confuses me. You say “1. The master sends the start condition to every connected slave by leaving SCL high and switching SDA to low:” and yet the diagram shows the SDA line going from low to high. Am I seeing this correctly? Step 6 is similarly confusing as you say “6. To stop the data transmission, the master sends a stop condition to the slave by switching SCL high before switching SDA high:” The diagram shows both lines high already with SDA going low before SCL. I follow your written explanation but I don’t think your diagrams do. You’re right, step 1 could have been written better. I re-wrote it and hopefully cleared it up a bit… In step 6, I think it’s the direction the bits are being sent that might be a little confusing. In the diagrams, picture the bits travelling from left to right, so in step 6, the SCL line switches high before the SDA line switches high. Otherwise good articles and helpful explanations. Thanks for the work. Thanks. This is a very interesting article. I’m not fully understanding point 4 however. When master is transmitting to its chosen slave would the sda line of all slaves not be pulled high as they are all sharing the same line? Have the same question. It’s like all the other slaves will also receive the data which is not meant for them. 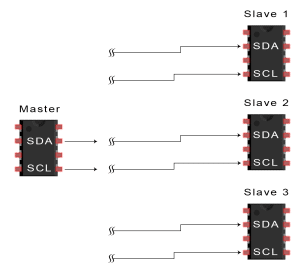 If it is correct, is it possible to transmit data to only one specific slave with I2C? good article .i think it is better to explain about arbitration clock stretching /synchronization about why pull ups …. Did I miss it or do you talk about how to handle communication with multiple I2C modules that use same Address ? 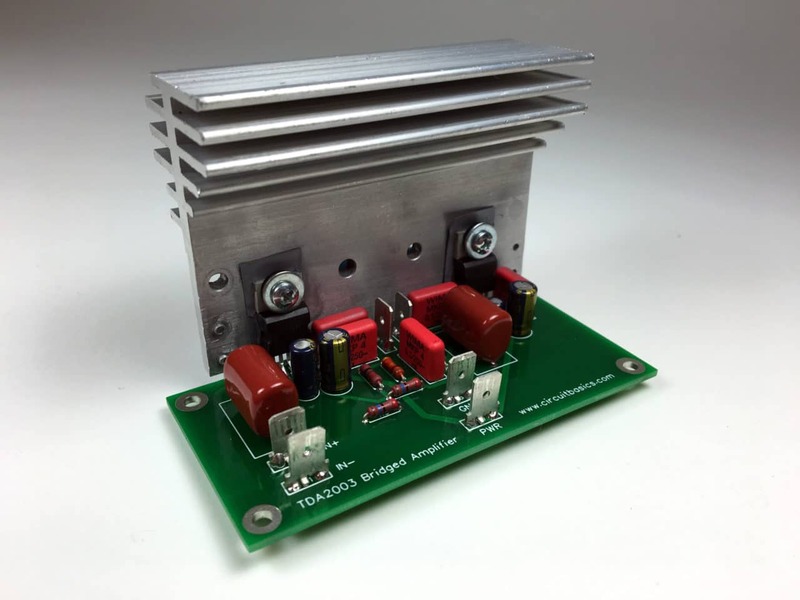 You could add a chapter about I2C multiplexing and how to handle it for example with a TCA9548A . 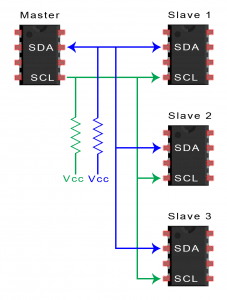 woow superb ….. its a really basic concepts of i2c….. 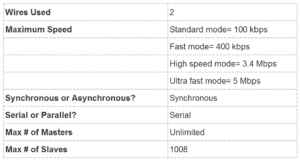 This article is very good for beginner to study the serial communication protocols. The concepts are easily understood. This is an extremely fascinating article. I’m not completely understanding point 4 be that as it may. At the point when ace is transmitting to its picked slave would the sda line of all slaves not be pulled high as they are on the whole having a similar line? Nice article. Can You define CAN Protocol? and Point no.3 is confusing for me. Under “Single Master With Multiple Slaves”, while describing how using a 7-bit or a 10-bit address frame, it’s written so: 128 (27) and 1024 (210), while it should be 128 (2^7) and 1024 (2^(10)). I was stuck there for a while ._. When you state the SCL goes “high” or “low”, does this basically mean it is “ON” or “OFF”? It’s just a clock signal at a specific frequency based on a crystal? No data is sent over this line; it’s just the set clock frequency? And what is a typical frequency? Since polarity and phase cannot be set as with SPI, would this not be a disadvantage? 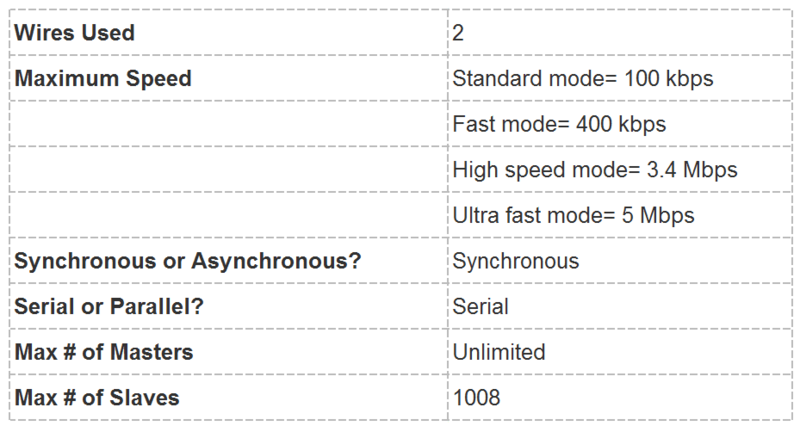 Are these parameters sometimes adjusted for better communication, and thus SPI might be a better choice over I2C ? HI: I have spent several day trying to get the I2C network to work with no luck. I am trying to connect a RTC 3231 and a 16X2 lcd display.Each will work seperatly but when I connect both of them, the RTC works but the display doesn’t. Explanation is very good. But in I2C, 7-BIT addressing, 10-BIT Addressing Explanation is not there.